The beauty of going on a retreat is that no matter where you go or how long you stay, you'll always meet yourself when you get there. Are you ready to listen to a bird singing, deeply breathe in the smell of flowers, grass or earth and delight in a soft breeze blowing on your face? Without the pull of deadlines, relationships, the Internet, or other media, if we give ourselves time to go deep into our own hearts where we can fully reflect on our joys, sorrows and fears, we can own them, release them and come to understand our path more intimately. "The Awakened Heart Journey" is about taking this time...this space...to awaken, discover and renew. 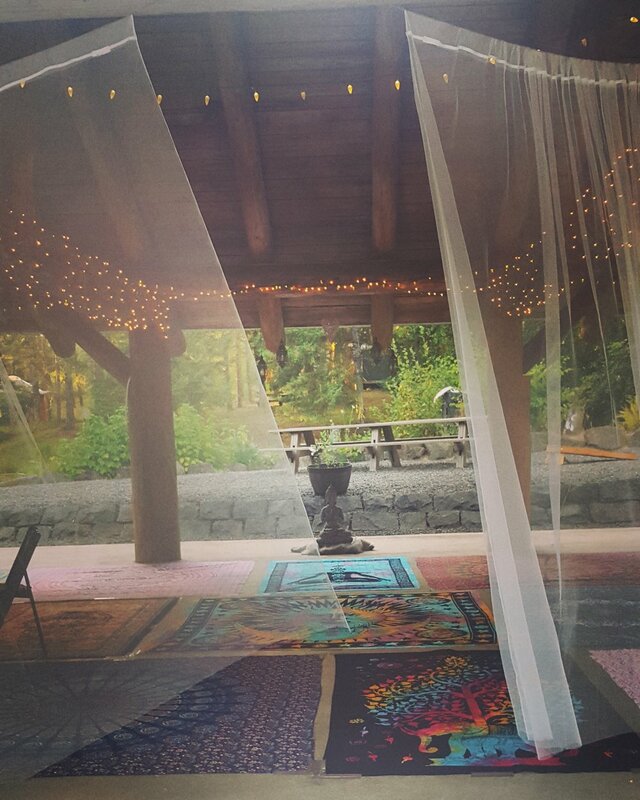 Gentle yoga, meditation to the sound of crystal singing bowls, with the healing energy of reiki, great food, time to yourself and time to connect with other women will be just a few of the very special things you will experience at this 4th Annual Women's Recovery Yoga Retreat. Open to all women, on the path of discovery. Linda Santilli Taylor, Cathy Lawgates, Halie Taylor and myself (Julie Bertagna) will be your gentle guides. Come be with us at the amazing Vernonia Springs this Summer. Investment: Early birds until July 2, $299. After $349: includes camping, yoga, all meals, coffee and tea. 1 glamping yurt available for $198 with one queen bed and 2 comfortable cots if needed. Occupancy can be up to 4 women. 4 Glamping wall tents with 1 queen bed, 1 bunk bed for up to 4 women (bring your own bedding for the bunk bed if used) $98. Tent rental for $25 set up, Bring your own bedding. Contact me directly to book. They go fast! May 7, 2019 at 6:00pm in The Yoga Loft. Class will commence the first Tuesday of every month! Coming soon is a Y12SR (Yoga of 12 Step Recovery) Meeting too! "When one or more are gathered together, miracles occur"
Addiction comes in many forms and can creates chaos in our minds and bodies. Recovery yoga will give you the opportunity to break through addictive behaviors by aligning your heart and spirit with the life you want to lead, creating peace and harmony within. Our time we have together is a chance to gather with love in a safe , truth-seeking environment. Anyone is welcome, whether in recovery from addiction or not. I honestly believe we all have something to discover! If you want to change behavior, you must change consciousness. That is where freedom is found. This is a practice for all of us that want to be on the path of discovery and healing. I heard it said that "practicing yoga provides the the cup, pranayama, breath work, empties the cup, and meditation fills the cup with sweet nectar." There is no experience necessary, just a willingness to arrive on your mat and breathe. Investment $10, Please email me with any questions and please don’t let the cost keep you from coming. Let me know how I can help. Schedule a group or private session with the relaxing, calming, and healing energy of crystal singing bowls. Played throughout a guided meditation and gentle yin practice the sound surrounds and resonates deeply within, leaving you feeling transformed and rejuvenated. Celebrate a special event with an empowering, intention setting, group yoga session for your birthday, bridal shower, Mother’s Day, Father's Day, family/friends reunions, healing and gratitude circles, or any other important get together with the people you want to surround yourself with. I will help you create the experience you desire with an inspiring ceremony, meditation and yoga practice of connection to make your special day unforgettable. This special event can take place in The Yoga Loft, my private home studio, or I can travel, with mats and Singing Bowls to you! The Yoga Loft can hold up to 20 students. All you need to do is show up. Whether you are new to yoga, seeking a deeper look into your practice and the path of inquiry, or want to learn how yoga will enhance your recovery, private sessions with me can be streamlined to what you need to transform, breakthrough obstacles and create new practices for healing and well-being. Please email me with any questions! julie@juliebertagnayoga.